If you’ve ever despaired that your sweet tooth is the bane of your existence, stop what you’re doing and go get a copy of my dear friend’s new book, JJ Virgin’s Sugar Impact Diet. 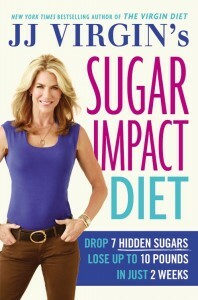 You’ve probably heard of JJ Virgin – she’s a clean-eating, smoothie-sipping, burst-training goddess after my own heart – and her latest book tackles a subject that even I struggle with occasionally: sugar. Whether you think it’s evil, heavenly, or OK in moderation, sugar can sabotage even your most well-intentioned efforts to eat healthy – mostly because consuming it (whether the source is candy, cookies, bread, or a mojito) causes cravings for more. Sugar is insidious… a sneaky little devil that can set the stage for diabetes, cardiovascular disease, and fat storage. “Yeah, yeah, I already knew that,” you might be thinking. But did you know avoiding sweet treats may not be enough to combat the sugar problem? In JJ’s new book, she outlines how seven common foods—plus sugary sauces, condiments (even balsamic vinegar! ), alcohol and other sugary drinks, natural and artificial sweeteners – can be sugar traps, and why these foods might be at the root of common symptoms like weight gain, fatigue, bloating, and inflammation. I love the case she makes against grains, certain root vegetables, high-fructose fruits, and diet foods. One of the main arguments made in JJ Virgin’s Sugar Impact Diet is that there isn’t one right way of assessing how a food’s sugar content is either good or bad (for example, asserting that blueberries have “good”sugar because it’s from a natural source). Because it’s one thing to read nutrition advice and quite another to put things into practice, JJ also offers a two-week, low-sugar diet plan to help you reset your taste buds, improve digestion, rev your metabolism, and speed up weight loss. Some great recipes, tools, and videos will help supplement the process, which doesn’t even require you to completely ban high-sugar foods right away – just that you slowly taper them off and move gradually toward a low-sugar eating plan. This will help you burn more fat, reduce inflammation, and even ward off chronic disease often caused by sugar overload. So if you haven’t quite been able to master the sugar situation, I can almost guarantee you’ll love this book. As usual, JJ delivers loads of science in such a way that’s accessible and easy to grasp. For a very limited time, grab your FREE copy here, and be sure to let me know what you learn!